We are working on the next version of all our code generation products. We plan to release all three products at the same time and expect all of them to carry the same set of functionality. Starting with this update we will offer both 32-bit and 64-bit versions of our software. 64-bit version will solve out of memory issue that may occur while working with large projects having hundreds of tables and thousands of fields. 1. Charts and reports drilldowns. Now you can use charts and reports as both master and details tables. We are working on the way how charts look in both master and details mode so bear with us. 2. 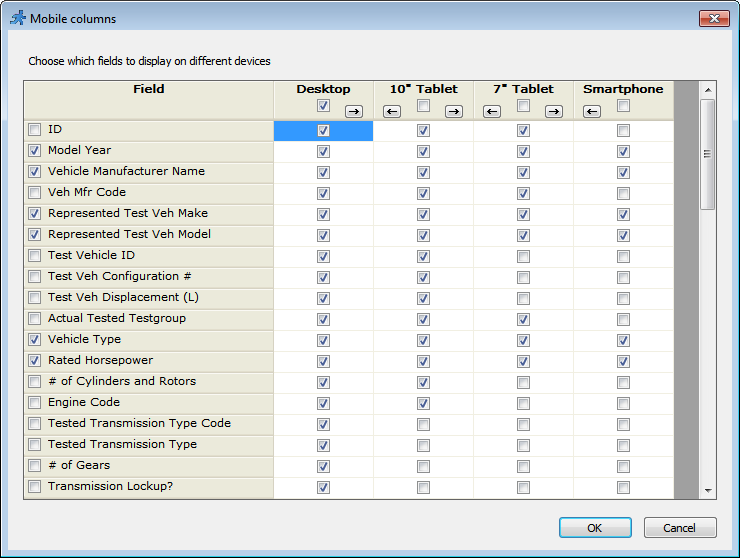 Different set of columns on different devices. This feature helps you customize your list pages hiding certain columns on devices with smaller screens. We need your feedback here. Do we need a separate option for smartphones in vertical/horizontal mode? Post your opinion it comments. 3. New dynamic permissions page. Works much faster than in previous versions. Check this live demo. Logon as admin/admin and then go to 'Admin area'. 5. 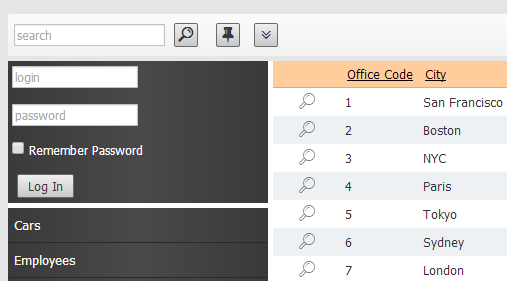 New multiselect options in Lookup wizard. You can now select multiple values in regular dropdown boxes, when you use 'List page with search, or 'Edit box with AJAX popup' mode. 6. New customizable style of popup windows. Window content is scrollable, header and buttons are always stay visible. Proceed here and click Add. 7. New login box styles. Give an option to logon right from the list page. Choose between login box in popup or embedded into the page. Supports both vertical and horizontal styles in embedded mode. 1. Create new login table right from Security screen. 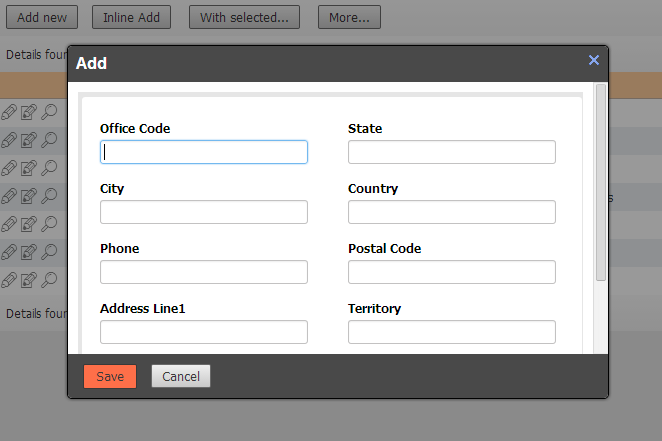 Login table contains all common fields and can be customized later on 'Datasource tables' screen. 3. Crosstable reports - option to customize 'View as' type of each field. 4. Option to create a SQL script for tables/data transfer to another server. It would be helpful to have business templates be easily removed from a project. Right now it is difficult to remove a business template and start a new one of the same type. I like some of the new features including the cross tab reports and the new reports features. Is there any development based on date and/or time events? For example you have events based on an add, edit, etc but is there something that perhaps you can create an event based on a time of day or a day/date. If there is already, where would i find that? Changes look great, I am yet to upgrade from 6.2 enterprise. However, my biggest issues are with the templates and the edit issues. Is it not possible to create print pages and friendly pages in a vertical layout as a simple option? Mobile templates should be responsive to the device with present templates. If user is on a smart phone then pages/views are disabled by default? Copy rights in admin mode – great addition. Great work as usual- this is the best application in the world. Sergey, you and your team are on it! Great additions, you make me look smart! Looks good, particularly the Charts as details option! Quick question, I like very much your product, I’m not a programmer but a user of MS Access, I’ll like to purchase your product but is too high for me, been a solo programmer. Do you have any small system to start? Also, could I change the look and field of the database using some other graphics like this for example http://themeforest.net/item/coral-app-website-startup-kit/6135908 or I need to used always the system platform. I like your program to create the database but need to know if the design area is also flexible. multiply tables on one screen, for example : one screen divided by 4 , one quarter will show table1.list the secend qurter will show table2.add the third quarter will show table3.view and last quarter will show record Detail of table3. No PhpRunner for OS X yet? As always!!! YOU DO NOT DISSAPOINT!!!!! I have been waiting for the drilldown charts with anticipation for a while and finally here!!! Thank you that is awesome!!!! ad item No 3: Does this change solve problems with ‘max_input_vars = 1000? Would events be senseful for dynamic permissions? Would be great to show date-bounded datas in a calendar sheet, maybe all month days horizontally and beneath the datas vertically. One Suggestion – If we can have new feature to add child record in popup. This would be great for large projects specially where child contains lots of fields. There are currently no doubt you are the best. I’m not a great expert php but now you surpass all your competitors ! All new features (including those minor new features) are great. Well… our opinion is that it should be possible to show the columns both vertically and horizontally…. for our applications this new feature will help a lot. Currently we participate as beta testers of various software vendors. The best applications we evaluated, have this feature (for example: http://freshdesk.com/). Sorry for my poor knowledge of the English language. Awesome, Thank you for your great work. I will comment again after looking better new features . By all means configure for smart phones and pads. Just my opinion – but adding a few frills to PHPRunner will not cut it. PHPRunner needs to become a complete IDE. Please give us the ability to create static pages, portals, to incorporate third party jQuery widgets etc. in the PHPRunner environment. Sure I can use a mash up of products to do this, but I want the convenience of a single development environment. I am willing to pay for that convenience. Best getting more better. I really love this software. Love the new login box styles! I’m very happy to hear this news. PHP/ASPRunner is simply awesome. Sergey, thank you very much for your work!!!! The “copy permissions wizard” is amazing. Thank you times infinity! I cannot wait for the new version. Your program has been a godsend for me and my business. Yes the option to choose horizontal or vertical smartphone layouts would be nice but if you choose not to then I would recommend using the horizontal layout only. 1. Similar to dynamic permissions page the “Assign users to groups” page should also have the same features. 2. In the events, while using DAL I think the field list for the selected table should also be available in the auto suggest drop down. While row highlighting on hover is nice, it would be better to be able to highlight a row by clicking a checkbox so when the cursor is moved, the row highlight remains. phpMyAdmin works this way. WOW ! ! ! let me know when its available. Regarding Mobile Devices: special for Smartphones and smaller Tablets up to 7″ there should be vertical and horizontal mode available as option. Wow, amazing. The last major version just came out and you’re already adding so much! I can’t keep up; I am still trying to utilize features from the last 2 updates. But keep it up – I love it. “add child record in popup” – that would be nice. “show multiply tables on one screen” – great from creating a “portal” look. And I’d still love to see a “group by” feature on list pages, with expand/collapse sections, like the KB template. Thanks for your great product. And happy holidays to everyone at Xline. Awesone, I will try next days :). Thank you for your great job and happy new year to all. After 5 minute looking around the trial version, ican say that I love the new features, will test it better after holidays, thank you again. 1st, my personal award on this 7.1 preview and new features. GREAT NEW FEATURES. Especially on the smartphone on/off field dsiplay options…, I had been killing a lot of time on a project to use tabs/sections to get all in shape on a 5 inch smartphone VERTICAL display. So, on yours “Do we need a separate option for smartphones in vertical/horizontal mode?” it would be really a time-saver once HORIZONTAL mode can be added or either can be set as default on a smartphone display as list pages usally consist out of several columns to get viewed. Sorry for my Jan 1 posting, just saw, the VERTICAL/HORIZONTAL oriented smartphone display issue is already done as wished! Is it possible to produce pivot-table charts as well as pivot-table reports. 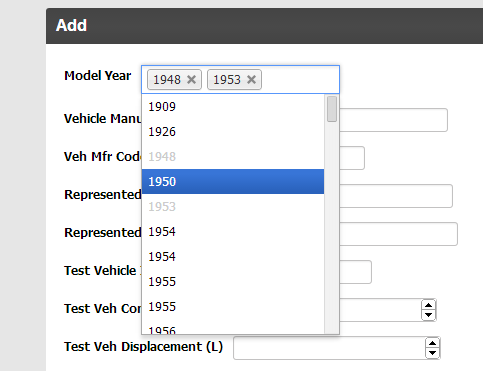 For example id like to be able to show changing values over time for a number of different categories. each user will have different categories and so the pivot table would need to be created dynamically. This is hard to do in MySQL and impossible I think without access to MySQL procedures (which PHPRunner doesn’t support). Any help you can provide would be great. Using this development tool, make me more productive than others. I wouldn’t put it as blunt as Brendon Sidebottom above, but merging PHPrunner with (elements of) a tool like WYSIWYG Webbuilder could make me a very happy developer. Of course I have no real notion of strategy and tactics in the commercial market of today, but it seems to me that no IDE with that combination of features exists. Still, compliments for the development team on the new version 7.1! The options for tablet and smartphones are a good move towards the future. That’s Great ! but please show me the form like report, if you have done so, like for example invoice, cash voucher etc. Having memory problems with 32-bit as a result of the size of my project I have been in “on halt” state to complete my project for couple of months time. So I can continue now..
Another time saving improvement in large scale projects is multiple column add/edit/ view forms generations. Do we need a separate option for smartphones in vertical/horizontal mode?